I'll be heading out on vacation soon...first to visit my Aunt Elaine in Ohio. While I'm there we will get to go see Kim's Study In Contrast in person which I am so excited about! After that I will continue on to Buffalo where about 60 garden bloggers from around the country will be gathering for several days of garden viewing, tours, sharing, eating, drinking and fun. I think we're ALL excited about that! After all that excitement I will cross the country diagonally and spend time with the Sweet-Granddaughter and her family in San Diego. What we do there remains to be seen but I'm hoping to hit a few garden centers I've heard of...San Diego is a hot bed of succulents which I am addicted to at the moment. I wonder how many I can carry on...maybe I can mail my clothes home? In the meantime my garden will continue to do its thing with the care of two garden assistants...my husband and my son. Hopefully I will have left good notes on the care and watering needs of the garden but I will still miss a few things. Will these tomatoes be ripe before I return? What about the beans that are already flowering? I wonder if I should pick off the blooms before I go? These Italian peppers are actually ready to be eaten...I'd better plan to use them up. 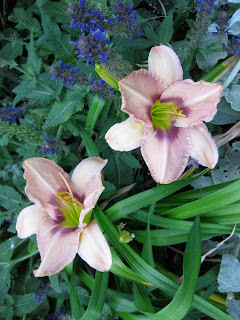 One thing I won't miss is Lilium Landini which has started blooming so I am at least getting to see some of the blooms! Shastas are beginning to bloom along the front entry path as well as in several other spots...always cheerful, always reliable, their only fault is they are so enticing to earwigs. They lose something when their centers are eaten up. So far this year the earwigs have not attacked, a wonderful and perplexing situation. I've certainly seen plenty hiding under things so I know they are there. I think I will not question it and simply enjoy the intact shastas. Glossy Abelia Edward Goucher blooms for quite a while. Sweet tiny trumpet shaped blooms cover the shrub. Scented geranium Lady Plymouth is beginning to bloom along the driveway. Hemerocallis Exotic Echo blooms surrounded by Salvia May Night. Dwarf Carnation Evermore blooms almost year round here. It is truly one of my favorite old reliable plants. But today it surprised me when I was taking photos. One flower, out of maybe 50 presently on the plant and after 5 years in the garden, appeared as an all pink bloom. Kind of cool to do so for Bloom Day! The Bat Faced Cuphea is just beginning to bloom. I bought this plant several years ago after seeing it on Annie in Austin's blog, The Transplantable Rose. I had a young girl in my child care who was batty about bats...and so had to plant this for her. Here's your plant, Heather! Strangely enough, there are a few bearded iris just blooming, long after the main iris show. They seem to be trying to show up the agapanthus that is just beginning to bloom. Rosa Berries and Cream and Regina alstroemeria are in the background. Carol at May Dreams Gardens invites gardeners around the world to share their blooms on the 15th of each month. Visit her to find other gardens and see what's blooming this month! You never know what you might see in your garden if you are paying attention! Yesterday I lost a big branch from the normally well-behaved Bradford pear in my front garden and I went out to cut the pieces that were keeping it hung up in my privet hedge. Luckily it is a privet hedge because although quite a bit was broken and had to be cut out we all know it will return and be better for the pruning anyway. It also took out a chunk of a large pittosporum which will likewise be fine. I feel really fortunate that nothing less sturdy was damaged...the branch that fell was over 25 feet long, the main part was over 6 inches in diameter, and there were 7 smaller branches about 10 feet long each attached to that main piece. The hedge took the brunt of the fall and protected all the smaller plants below. As I was cutting it out of the hedge I could hear what I thought was a bushtit chirping away. I've only see them traveling in a flock so thought it must be something else. Whatever it was I worried that there had been a nest that had come down with the branch since the bird was so noisy. Today I went out to continue cleanup, cutting the broken privet and pittosporum branches and beginning to cut 18 inch pieces from the main trunk to save for firewood. I could hear the same bird and finally investigated more closely. And found that there was indeed a nest! True confession time...this is a city tree and I really need to call and have them work on it because it is covered in mistletoe. So don't wonder why those leaves don't look like pear leaves...mostly you see the mistletoe. I have to wonder why they chose the spot that they did...it is only about 12 feet up and over the sidewalk...one would think they would have chosen a quieter spot. Someone was looking out for them though because had the nest been on the other side of the tree it would be history now. I have a crick in my neck from looking up for over half an hour watching the parents deliver insects to the unseen babies. I imagine all the chatter goes something like "Can you believe that happened? Do you know how how lucky we are?" And they're right! I had my gate rebuilt a couple of months ago and have been working on making this entry to my garden feel more welcoming. I finally realized a small trellis to tie it to the color of the house trim was what it needed. So this morning I built a simple trellis out of 1x2 inch redwood, painted it and hung it on the fence with small spacers. Now comes the fun part...I need to decide on a small, evergreen, full sun plant to complete the project. I don't want to have to work to keep a plant in line here and this spot gets wicked heat on summer afternoons. It also doesn't get watered especially well so that is another constraint. I'm trying to stay away from the nursery until I make a decision...or at least until the paint dries.